DAK's BEST SELLERS 6 PACK - 100% Sodium Free! Spice and seasoning for steak, poultry, fish, veggies containing 0% SALT! FREEDOM from Salt, Low Salt, Low Sodium! DAK'S SPICES "BEST SELLERS 6 PACK"
- Green Zest: Like flavor but don't want the heat of spice? Try GREEN ZEST!!! A perfect blend of herbs and zest of citrus that will elevate any meal without salt. - Super Greek: This is the spice you can take home to mother! Create a great Greek flavor in your foods, without any salt! - Taco Knight: Want a quick way to add Southwest kick to your recipes without much effort? This carefully crafted blend of salt free spices is all you need. NO QUESTIONS ASKED 30-DAY MONEY BACK GUARANTEE! Go all natural! No artificial additives. "These spices are amazing! I can't say enough good things about them. I use them all the time." SUPPORT YOUR DIET AND HEALTH with these natural seasonings and spices! Unshackle your heart! FIRE UP YOUR GRILL with steak, poultry, fish, and DAK's DELICIOUS rub-worthy seasonings and spices. 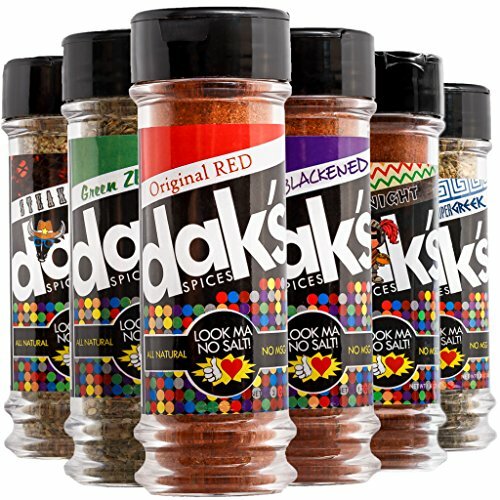 "DAK's is a great seasoning option for those who are watching their sodium, but want full flavor!"